OnePlus 6 vs Huawei P20 Pro: what would you sacrifice? Both OnePlus and Huawei have released two exciting new top-range devices. These are new generations of two lines of devices that are widely followed and loved by users: two different smartphones that meet different needs. Which is more suitable for you? The answer is in our direct comparison! Choosing a new smartphone isn’t easy. Especially when we talk about the latest flagships, which are all characterized by very similar designs and important labels. Both in terms of design and price, some manufacturers try to differentiate themselves in order to emerge in the crowded Android jungle. The OnePlus 6 and Huawei P20 Pro can’t be described as two very similar prices, especially if you take into account the software experience and the list price. Both feature a technical data sheet worthy of a 2018 flagship that is reflected in everyday use: the performance offered by the Kirin 970 on the P20 Pro and the Snapdragon 845 of the OnePlus 6 won’t disappoint gamers and demanding users who like multimedia content and multitasking. However, there are differences between the two smartphones that you should consider before purchasing so you can choose the one that best suits your needs. The Huawei P20 Pro stands out from the OnePlus 6 and all other devices currently on the market with three rear cameras: an 8MP sensor with an aperture of f/2.4, a 40MP RGB sensor with an aperture of f/1.8 and a 20MP monochrome sensor with an aperture of f/1.6. Beyond the data on paper, the P20 Pro’s camera delivers great shots even at night and the bokeh effect offers beautiful portraits by precisely focusing on your subjects. The colors are vivid, in some cases due to the action of the NPU integrated in the Kirin 970 that allows the camera to recognize the framed subjects and manually set the mode best suited to the context. If you’re not satisfied with the results, you can turn off artificial intelligence from the camera settings. Another advantage of the P20 Pro’s camera is its speed and ease of use. The Huawei P20 Pro is a beautiful and well made smartphone. The similarities with the iPhone X can be seen (in front with the notch and in back with the vertical “traffic light” style of the camera), but this doesn’t mean that the P20 Pro isn’t spectacular with its flashy Twilight and Midnight Blue variants. If you’re tired of putting a serious black smartphone in your pocket (the most colorful alternative to the OnePlus 6 is Silk White), the P20 Pro Twilight, with its shiny glass frame, can recreate pleasant effects with light reflections. One small note: keeping the frame clean will be difficult! Huawei has decided to make the P20 Pro officially water and dust resistant and IP67 certified. This is a novelty for the P series, which until the previous generation, didn’t offer this important feature for many users and that, in my opinion, all flagships should have. The OnePlus 6, on the other hand, still doesn’t offer this certification. One of the strong points of the OnePlus 6 is undoubtedly its price: you can currently buy it on Amazon for $624 for the model equipped with 6GB of RAM and 64GB of internal memory, or you can opt for the larger version with 8GB of RAM and 128GB of storage for $679. The price difference between the OnePlus 6 and the P20 Pro is remarkable considering that Huawei launched a single model on the market with an Amazon price currently at $931. It comes with 6GB of RAM and 128GB of internal memory. The OnePlus 6 runs OxygenOS based on Android Oreo. The system is lightweight and very close to Android stock, an advantage for all those users who don’t like personalized skins offered by some brands, including Huawei’s EMUI. It isn’t a 100% pure version since OnePlus has integrated some special functions such as the option to opt for a dark theme in the settings menu. There are also gestures that serve as shortcuts to apps and other features. From the settings menu you can also deactivate the notch (you can also do this on the P20 Pro) or activate the reading and game modes. In terms of the software, the OnePlus 6 will receive the update to Android P, but it isn’t set in stone when the update will happen. Unlike the P20 Pro, the OnePlus 6 has continued to integrate the headphone jack on the underside of the device. This means that you can continue using your old headphones without having to rely on a Bluetooth headset. To stay on the audio theme, the OnePlus 6 integrates a mono speaker that can be easily covered with your hand when using your smartphone horizontally. 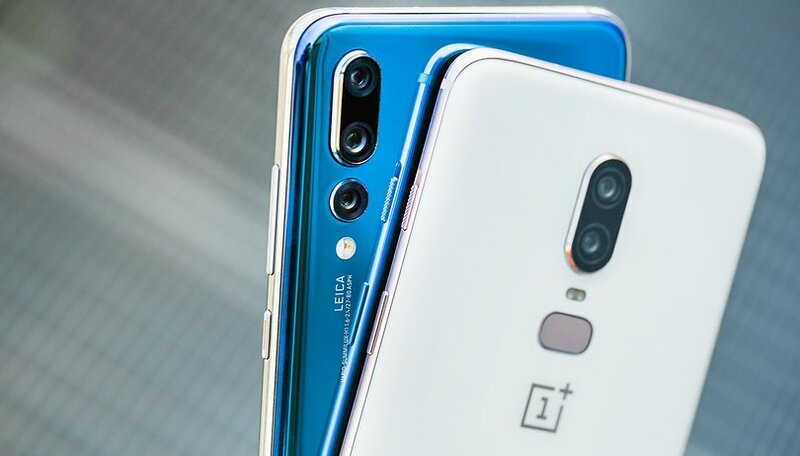 These are both high-end flagships and both were released in 2018. Although the P20 comes with a processor from 2017, it still performs well. Both devices are well-designed and offer excellent components. If you have a tighter budget, the choice is obvious: the OnePlus 6 will give you great performance and surprise you with its speed. If I could spend a bit more, and also keep an eye on carriers’ offers, I would go straight for the P20 Pro. It’s no coincidence that I’m using is as my personal device. It has everything I need: an excellent camera, good battery (though not surprising) and a good design. The P20 Pro hasn’t made any compromises, and when I buy a new flagship, that’s what I’m looking for. Now it's up to you to decide: which one was more impressive to you? Huawei P20 Pro, no doubt. Not really excited about either of these. OnePlus 6 is a ridiculous choice to make. The glass back introduces fragility without the wireless charging nor IP rating; the headphone jack has been abandoned; a mono speaker?! ; a notch :'( ... So many poor decision at once. If only their customer service had a better reputation. OnePlus 6 is playing in Apple territory: leverage on a customer base that don't use the brain but only brand foolishness. The p20 pro is a beautiful phone that strives to be competitively advanced as it can, can't wait to see the next one with the 980 soc. OnePlus isn't missing much, and a beaut too(especially the price). Damm, better get honors next flagship, as huawei's tech comes to honor, with honors lower price.